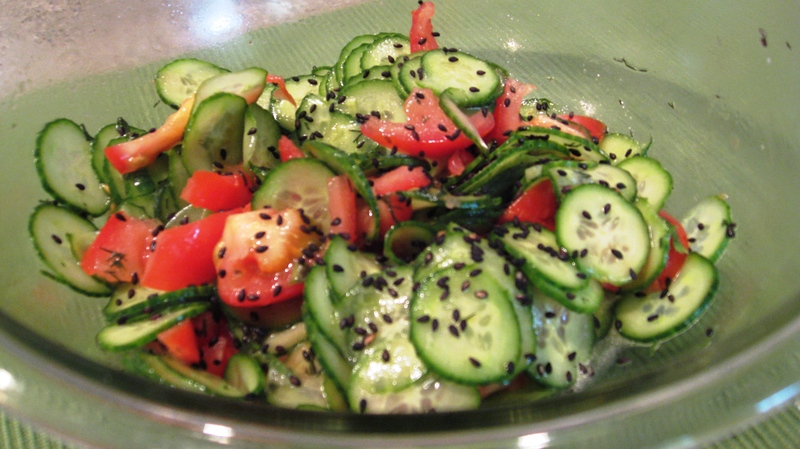 It is hot out, so we are opting for side dishes a little lighter and more refreshing, like this delicious cucumber salad, made with fresh ingredients. Pair it with you favorite protein, we enjoyed it for dinner with our favorite pork chops – watch for the post coming up! Mix the veggies carefully with a big spoon and chill for 15 minutes if your veggies are not straight from the refrigerator. Enjoy this salad anytime with any of your favorite proteins. Perfect! Read this post, had everything on hand and made it immediately! Gardens are overflowing with cucumbers and tomatoes this time of year and we’re always looking for something to do with them. Everyone loves the salad and the kids were especially thrilled with the addition of sesame seeds. Thanks! I’ve been making my own version of this this year. I haven’t used the dill or vinegar. I’ve let the fruits (cukes, tomato, onion) make their own juice. Absolutely refreshing and yummy. This is the only way I can tolerate raw tomatoes.